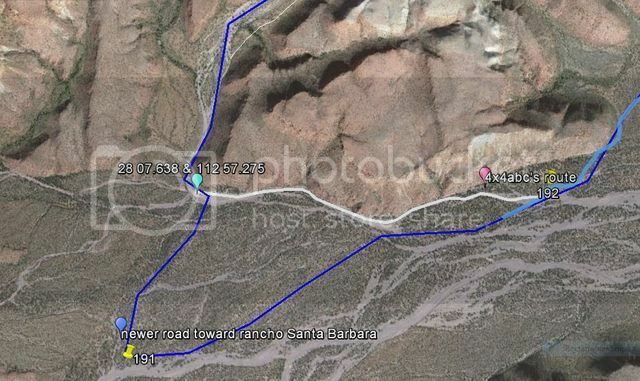 BajaNomad » Baja Special Interest Discussion Forums » Baja Off-Roading » NO wimps ? Author: Subject: NO wimps ? Anyone been on no wimps recently or heard if it's in rideable condition? Starting a couple of week ride next week and still planning routes. off topic, but - i know of a place called WIMPS AND GIMPS! pretty sure you guys have no idea what that means.... enjoy the ride! Mike, search posts by 4x4abc on that route south of El Barril. Tried it last Dec. and the road was COMPLETELY wiped off the face of the earth past the turnoff to Santa Barbara. We met some mountain-bikers near there that were disappointed, as they wanted to go through. The storm obliterated everything in and around La Fortuna Wash with large boulders everywhere. I would assume that whatever remains of the road south from there would be even more damaged. I may go back to hike out to the hacienda ruin near San Miguel to do some research on it . . . and that palo blanco forest must be one of the most beautiful places in Baja. Just watch out for the cranky burro that lives there. The squarecicle and I are/were planning on scouting out the NWT later this week. 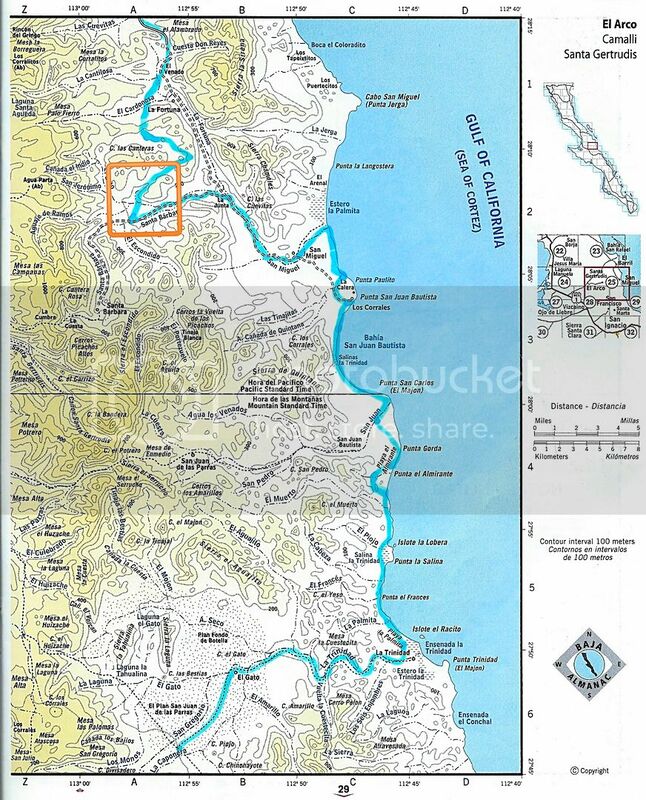 Our plan is to check out the northern section at the R Santa Barbara/R San Miguel jct. If and that is a big if, we can get thru without difficulty we'll take it all the way down to hwy 1. If not we plan to go down and drive up the trail from San Ignacio and go as far as we can. abc4x4 made it thru in March of 2015. They had to do some road building at the north end and the south end where it come from the SOC at Trinidad. Here is his report. Since then there has been a group of side by sides going thru to Trinidad at the south end. I say are/were because there has been a complication that may delay us a week or so. Thanks. We are going to be loaded pretty heavy as we are doing an unsupported trip we'll go around. Heck Mike, get TMW and SquareCircle to haul your gear - both good guys that would help in a flash! That way you can check the route ahead for them. Green Door trail had a few wiped out areas also. Rich T, allow me to assist with your photo posting. U2U or email me as these new photos would be awesome to see. Thanks! info at vivabaja.com for email if not u2u. Thank you Rich T for update. I talked to Sat Mike other day we agreed good, Idea for him to skip no wimps trail at this time. Red flags are little day light,getting lost running out of fuel.No support truck at other end. I know Mike has a 5gal tank on his bike,but that makes it that much harder to ride. I would think on a off road bike Feb or March better time. Rich T - So good to hear that you persevered to get through! We got as far as the turn off junction to Rancho Santa Barbara early last year, and the boulder packed wash where we would have had to go looked like too much at the time. We got as far as w/p 191 and retreated, for some of us it was a gasoline issue as we also did some sight seeing along the way. Shortly after our attempt, another Nomad 4x4ABC and two other four wheelers made it through. They did not proceed as far south as the boulder strewn wash but turned east at what on the Baja Almanac is shown as La Junta. Their route bypass is shown in white on the attach screen shot, with the gps reading at the beginning of their "detour." The bypassed several other sections further south but this initial bypass I believe removed the worst of the hurricane damage. Somewhere is their trip report with photos of the difficulties they encountered. Gato the last 45 miles into San Ignacio were easy. Rich, what was the condition of the Trinadad Wash - between La Trinadad & El Gato? OK... and I will also share the steps to post photos here (or any other forum)... the key is pixel size, not file size. High-quality photos that don't mess up forum pages by being bigger than the 800-pixel page. Gato turned into a huge boulder field wash, you do not want to follow the wash, if you do you will end up in the wrong canyon, if you were ever thru there before you will remember how it felt like you were going in circles on the old road, you will find yourself zig zagging across the wash, pick up a piece of the trail and then you will be back in another wash, on our way back from San Ignacio it was at night and that was really interesting. If some one were to go thru now they could probably follow our wheel tracks for a good part of it.